Bavarian-born sculptor Jürgen Lingl-Rebetez's personal style is powerfully apparent in the passion and animation which shines through in every work he creates—his sculptures resemble three-dimensional drawings, carved from wood with the aid of traditional tools and a chain saw; he then applies color and pencil to enrich these vibrant, impressionistic surfaces. Jürgen's classical education permits him a creative freedom not limited by any technical hindrances to explore subjects ranging from angels and holy figures, to monuments, nudes and animals. Since 1999 he has been living and working in France. How did you learn your craft, and what drew you to work primarily with the medium of wood? I wanted to learn the craft of the artist from the ‘ground up’, in a very old fashioned way, as was done in the Middle-Ages up to the 19th century. Longing to learn the techniques of artistic expression such as drawing, painting and sculpting, I began to search for a master who could teach me. There were not many left in Germany, but I found one such master who specialized in wood sculpture. When I approached him and presented a collection of drawings I had done, he told me to return the following week to begin training right away. I have always loved forests and trees, and I love wood as a living material. We have a very old tradition of woodcarving in Bavaria that dates back to the 10th century or earlier. I’ve felt a strong desire to continue this tradition based on the works of the old masters, like Georg Petel and Tilman Riemenschneider, and to develop my own approach in a contemporary style—but one that stands on their shoulders, and honors the contributions of their wisdom and knowledge of the craft. Speaking of your own style, many sculptors today develop an abstract and expressionistic approach, seeking to create a more individual aesthetic, while others commit themselves to a more realistic and classical style... your work appears to be both realistic and abstract, visceral yet dreamlike... how did you come upon this synthesis? Was it a deliberate choice, or did it happen in a more unconscious/spontaneous way? I believe the creation of one’s style is not ultimately a choice. The development of a style comes from the work; it’s a fluid process that’s constantly changing, like a river which flows over obstacles and barriers, sometimes reaching an impasse, yet always looking for another way, always searching for the sea. I aspire to improve my craft every time I start a new work, and this gives me the motivation and direction to find a synthesis between classical and contemporary approaches. 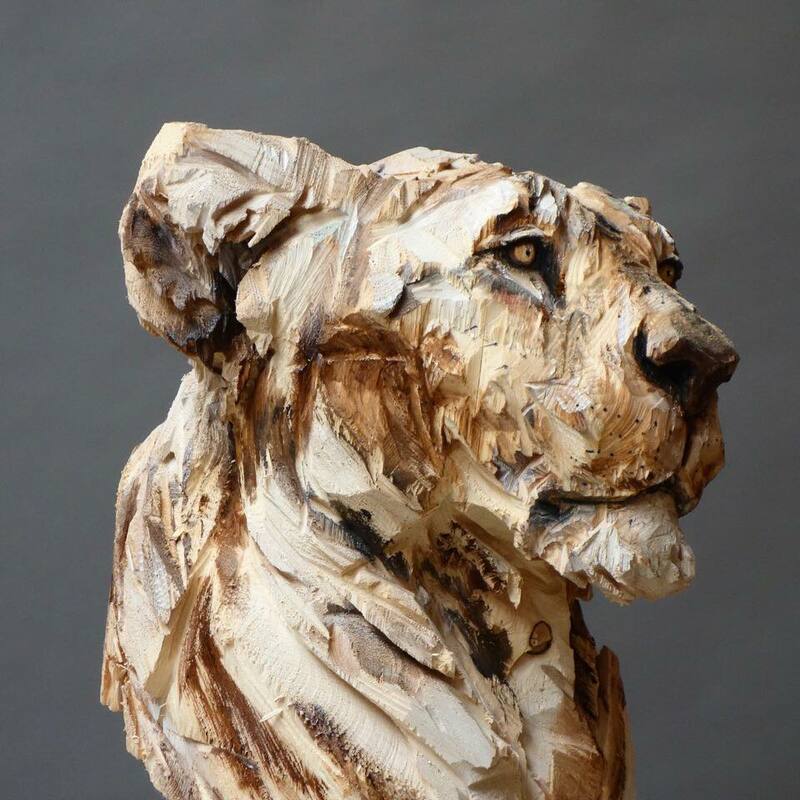 The rawness and ‘sketch-like’ quality of your pieces feels somewhat reminiscent of the Cave Paintings of Lascaux, albeit in a more developed aesthetic... what inspires you to choose animals as the subjects of many of your pieces? This reference to the Cave Paintings of Lascaux is very relevant to my work: like these ancient artists who were inspired to express the nature of the animals around them in a raw way —going straight to their essence— I try to do the same with my chainsaw. This tool enables me to avoid the temptation of obsessing over endless details, in favor of the freshness and spontaneity of the work. The contemplation of animals, their purity, their sincerity and their innocence compels me to represent them again and again. The animal is, for me, a well of inspiration that never runs out. What role does the application of pastels and color play in your work? It’s probably the influence of masters from the Middle-Ages to the Baroque era, and German Expressionism, that inspires me to apply color to my works. I feel I cannot leave my wood sculptures naked! What would you say is your primary source of inspiration? Presently I’m working on a project of monumental wood sculptures, and I’ve found that working on such a large scale means that since I’m going beyond the conventional concept of height, the proportions of such large pieces make one feel small, and therefore modest and humble —as we should be— to that which is greater than us… to nature. This is a good example of how through my art I wish to honor nature. The creative act itself is a catalyst of inspiration for me, and although I cannot always say exactly where my inspiration comes from —sometimes it comes, sometimes it does not— I’ve found that the state of being humbled by the presence of nature is always a good place for inspiration to find you.